Artificial reservoirs likely accumulate more carbon than natural lakes due to their unusually high sedimentation rates. 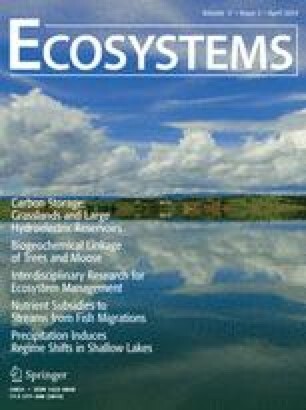 Nevertheless, the actual magnitude of carbon accumulating in reservoirs is poorly known due to a lack of whole-system studies of carbon burial. We determined the organic carbon (OC) burial rate and the total OC stock in the sediments of a tropical hydroelectric reservoir by combining a seismic survey with sediment core sampling. Our data suggest that no sediment accumulation occurs along the margins of the reservoir and that irregular bottom morphology leads to irregular sediment deposition. Such heterogeneous sedimentation resulted in high spatial variation in OC burial—from 0 to 209 g C m−2 y−1. Based on a regression between sediment accumulation and OC burial rates (R 2 = 0.94), and on the mean reservoir sediment accumulation rate (0.51 cm y−1, from the seismic survey), the whole-reservoir OC burial rate was estimated at 42.2 g C m−2 y−1. This rate was equivalent to 70% of the reported carbon emissions from the reservoir surface to the atmosphere and corresponded to a total sediment OC accumulation of 0.62 Tg C since the reservoir was created. The approach we propose here allows an inexpensive and integrative assessment of OC burial in reservoirs by taking into account the high degree of spatial variability and based on a single assessment. Because burial can be assessed shortly after the survey, the approach combining a seismic survey and coring could, if applied on a larger scale, contribute to a more complete estimate of carbon stocks in freshwater systems in a relatively short period of time. RM, FR, SK, ACB, and ALA designed the study; RM, SK, SJC, and ACB performed the field work; RM, SK, SS, and JJC wrote the manuscript; all authors participated in the data analysis and reviewed the paper. The online version of this article (doi: 10.1007/s10021-013-9735-3) contains supplementary material, which is available to authorized users. We are thankful to Marten Scheffer for the insights and critical discussions, to Carlos Henrique Estrada and Anderson Freitas for the support in the field and laboratory analysis, and to Marcio Malafaia for helping with the maps. The authors acknowledge support from Coordenação de Aperfeiçoamento de Pessoal de Nível Superior—CAPES (Raquel Mendonça), NWO-VENI grant 86312012 (Sarian Kosten), The Swedish Research Council Formas (Sebastian Sobek), and Conselho Nacional de Investigação Científica e Tecnológica—CNPq (Fábio Roland). This research was also supported by Grants from Furnas. ICOLD. 2003. International Commission On Large Dams. World register of dams. http://www.icold-cigb.org/. IPCC. 2007. Intergovernmental Panel on Climate Change. http://www.ipcc.chpp.